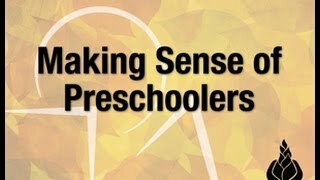 To make sense of a preschooler is to possess the keys for unlocking the mysteries of human nature as well as for the unfolding of human potential. This fascinating material takes the best that today`s science has to offer and delivers it in a usable form to all those involved with this enchanted and ensorcelled age group. This course is designed for all those involved with 2-5 year olds: parents, grandparents, day-care providers, and early childhood educators. No one is more susceptible to being misunderstood than the preschooler. Precocious, brazen, obsessive, endearing, hysterical, impulsive, anxious, delightful, unreflective, dogmatic, generous, unstable, aggressive, resistant, compulsive, and anything but consistent - the preschooler could qualify for any number of personality and behaviour disorders. Unlike infants and toddlers, preschoolers actually bear a resemblance to grown-ups and therefore fool us into thinking that they are much more like us than they really are. Projecting our psychology onto them is a typical mistake. To make sense of the preschooler is to make sense of the very essentials of human development. Once the primary principles of development are appreciated together with their purpose, the developmental deficits that plague the preschooler become transparent and understandable. Rather than pushing them to be other than who they are, we can celebrate their differences. Instead of trying to get them to grow up, we can attend to providing the conditions that are conducive to their transformation. Knowing what they need is the key to knowing how to dance with them. The six hours of instructional video serve as the ‘textbook’ for the course but this is only part of the learning adventure. Typically this course is delivered through our virtual campus with its rich resources and discussion forums. Participants will find much supplementary material available to enrich their experience. Study guides are also available to assist in digesting the material. The video material is structured for the greatest flexibility in both study and delivery, lending itself to three different formats. It can easily be divided into twelve 1/2 hour modules or six 1-hour sessions or four 1.5 hour sections. The Preschooler Course can be taken individually or in groups. Support for groups can take a number of forms: live Q&A or supplementary seminar or interactive workshop. This support is usually delivered through our state of the art video conferencing system, but if feasible, can also be delivered on site. The Preschooler Course is also scheduled as an online course from time to time, allowing individuals from all over the world to come together as a group in real time to take the course. Please consult SCHEDULED EVENTS for the next available offering. The instructional video is organized to allow maximum flexibility on how the course is taken. The six hours are divided into four 1.5 hour sections each consisting of three 30 minute modules. This allows the video component of the course to be taken in one of three formats: four 1.5 hour sessions or six 1 hour sessions or twelve ½ hour sessions. The instructional video was structured this way for the convenience of those most likely to take the course: early educators, preschool parents, and day-care providers. There are some significant ways in which preschoolers are not meant to be like us and we are not meant to be like them: their untempered nature, their characteristic inconsiderateness, and their ubiquitous separation problems. Their lack of development gives rise to a distinctive preschooler personality profile of common traits, despite their differences in genetics and experience. This preschooler personality profile can also be used to spot immaturity in older children and even in adults who have failed to grow out of the preschooler phase. The section is all about what is missing and why, along with the natural developmental resolutions for their appropriate immaturities. These insights should form the basis of our interaction with preschoolers. What preschoolers most need us to know is how we can compensate for what is missing in them as well as how we can set the stage for the developmental resolution. By irreducible is meant incapable of further reduction or simplification. This irreducible needs provide the bottom line for healthy development in preschoolers. In all our concern about which activities to engage them in and what kind of preparation they need for school, we tend to overlook the most fundamental needs of the preschooler. These needs are deceptively simple yet incredibly profound in their simplicity: to engage in true play, to find true rest, and to have true tears of futility. Fulfillment of these needs is the key to their transformation from the equivalent of the caterpillar stage of their life to the rest of their lifespan. In this section we explore what these needs are all about and the role they play in the healthy development What preschoolers most need us to know is how to ensure their basic developmental needs are met. We are forever trying to get preschoolers to be more like grown-ups. Many adults think they can do this this by attempting to prune out socially unacceptable behaviour. What many adults do not know is that preschoolers exhibit troubled behaviour for some very good reasons, developmentally speaking. When we battle against the symptoms of their immaturity, we can very well undermine their ability to grow out of these transient problems. Three troubling behaviours that fit into this category are tantrums and aggression, resistance and oppositionality, and shyness and timidity. In this section, participants learn what these behaviours mean developmentally and what kind of responses tend to backfire. Also discussed is how to compensate for these developmental hiccups and how to keep these disruptive problems from also disrupting the sense of relational connection that they require. What preschoolers most need us to know is how to address the root problems and how to provide the conditions that help them to truly grow out of these common signs of immaturity. When not able to make sense of the preschoolers in our care, we are predisposed to make certain common mistakes. In this section the six most common mistakes are discussed and suggestions are provided for how to avoid these pitfalls with preschoolers. Perhaps our greatest faux pas with preschoolers is to subject them to early socializing experiences and to pressure them to conform to social and societal expectations. Premature socialization undermines healthy development. Also discussed are the hidden developmental dangers of much of today’s instruction-based schooling and head start programs. What preschoolers most need us to know about them is that we do not need to push independence. In fact, to do so can makes matters worse. And finally, we also need to know that a premature focus on good behaviour actually interferes with the development within them of the most important human motivation of all - the desire to be good. The ability to be a ‘preschooler whisperer’ depends very much upon knowing what is inherent to the preschooler’s nature and what Nature has in mind for them when we do our part. The tuition fee for taking Making Sense of Preschoolers is $200. This includes a virtual campus student pass of four months to access the videocourse material as well as other supporting materials. If a personal copy of the DVD set is desired, the tuition fee is $275. Neufeld Institute faculty member Dr. Deborah MacNamara is the coordinator for this course.